No, I’ve never truly been a minister. I think people who don’t believe in God are crazy. How can you say there is no God when you hear the birds singing these beautiful songs you didn’t make? But I was singing loud, and most singers weren’t singing loud. Like, my mother would have company over, and I would sing so they’d pay attention to me. I don’t think a woman has to act like a man to show that she has strength. And I don’t get down on nobody else for doing whatever else they do. To each his own. God gives us the ability, but rock ‘n’ roll was created by men. I’ve never seen the devil create music. Now they have banging guitar and no bass and call it rock, but that’s not what I call rock. But I’m a rock ‘n’ roll singer; that’s my livelihood, my occupation. But men are so full of greed today, they’ll sell anything for a little piece of money. Richard Wayne Penniman (born December 5, 1932), known as Little Richard, is an American recording artist, singer-songwriter and actor. A pop music and culture icon, Little Richard's most-celebrated work dates from the mid-1950s when his dynamic music and charismatic showmanship presaged the rise of rock and roll. His music influenced many other popular music genres, including soul, funk and hip hop and shaped generations of rhythm and blues artists. Little Richard has been honored by many institutions. He was inducted into the Rock and Roll Hall of Fame as part of its first group of inductees in 1986. He was also inducted into the Songwriters Hall of Fame. He is the recipient of a Lifetime Achievement Award from the Recording Academy and a Lifetime Achievement Award from the Rhythm and Blues Foundation. 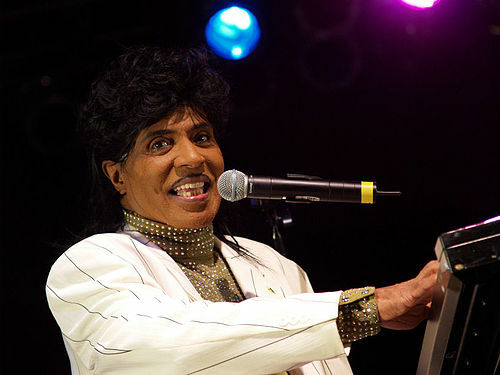 Little Richard's "Tutti Frutti" (1955) was included in the National Recording Registry of the Library of Congress in 2010, which stated that his "unique vocalizing over the irresistible beat announced a new era in music." In 2015, the National Museum of African American Music honored Little Richard with a Rhapsody & Rhythm Award for his role in the formation of popular music genres and in helping shatter racial divisions in the music industry.